Install a virtual machine with Windows 10 x64, do NOT install any virtualisation agent. After this is done install VeraCrypt and fully encrypt the disk. Lastly, disable access to cmd.exe. The other hardening measures are a bit too much work to re-implement, so we’ll just assume that nothing else is available except a disabled cmd.exe and an empty desktop. When you have decided on your preferred method you can use dd to perform the actual copy action of the disk. Just make sure you don’t mess up the use of the if and of parameters. You can also operate directly on the disk from the booted media, but this is not recommended. It can work, but if you make a mistake you won’t have a ‘known good’ working state to fall back to. The reason for this is the fact that this format supports snapshots, which makes it much easier to jump between working states when we are manipulating it. The important bit in the above command is the -cpu command, apparently sometimes QEMU and Windows 10 don’t play nice together and you need to specify a specific cpu model. 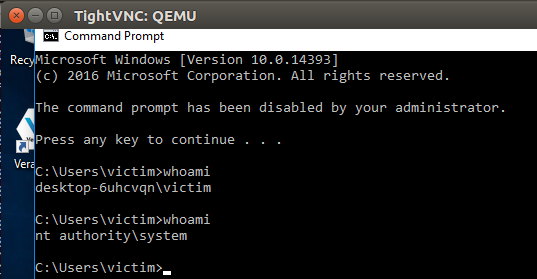 Luckily this was easily solved by searching online for the error displayed by Windows in conjunction with the ‘qemu’ keyword. This way we have the clean source and if we mess up really bad we can throw the branch away and start all over again. We copy the files from the panda project to the root of our QEMU branch and edit some of the files accordingly. You can skip over the next intermezzo if you already know your way around an unfamiliar code base. To locate the changes and files needed I mostly just used the online GitHub search the panda repository. I started by reading the README.md of the volatility folder which has a very unique command pmemaccess. One of the results is the file hmp-commands.hx which references the do_physical_memory_access function. Searching for it will find you the monitor.c file and the includes will show you the memory-access.h file. The last search is for memory-access which will show you the needed changes in the makefile. Now that everything has been copied and edited you’ll probably will encounter a lot of errors when compiling. To get rid of these errors the important approach is to closely look at the QEMU source of the same or similar files and notice the differences in types / includes & amount of arguments to a function. During this process it took some trial and error, but eventually the changes are pretty straightforward. The most difficult part was doing this at 3AM and just making very stupid edit mistakes on my side. If everything went according to plan we now have a new command and when we execute the help command in the QEMU console we should see our newly added functionality. First of all a word of warning, as far as I can tell volatility doesn’t handle live memory editing to well if data changes in between every read of write operation, which is kind of expected. I think it is perfectly doable to do it live, but for the purposes of this blog we’ll do it by pausing the VM, editing memory, resuming the VM. If you are wondering when exactly you’d need live memory editing, that would be when you are connected through hardware based direct memory attacks and there isn’t really a ‘pause’ option available. For those situation it should work out fine to translate these techniques to a search & replace approach similar to that of inception. Now that we have the executable file we can process it with our favourite disassembler, which in my case happens to be ida. Alternatives like radare2 or x64dbg would probably also work, although you have to keep in mind that the dumped executable can be somewhat broken. Since it also has symbols associated and available, make sure you get those as well since it makes reversing easier. If we want to re-enable cmd.exe it looks like we have to from point 3.2 in the above table to point 2. This can be easily accomplished with a jump to that location and since the code after it doesn’t matter to us we could even clobber it if we need some space. To compute the jump opcodes we’ll need to compute the difference between the address of mov ecx, esi and xor ecx, ecx which is a simple substraction that gives us the value 0xB352 or in decimal 45906. We compute this difference since we want to relatively jump backwards. While searching around for an easy way to generate the opcodes and some brainstorming in the NetSec Focus slack I found this website which saves you from compiling some assembly with nasm https://defuse.ca/online-x86-assembler.htm. Encryption is a good measure to apply, but it needs to be applied correctly. It is also important to keep in mind that encryption is not a silver bullet that will save you from every scenario. Next time you encounter an encrypted system don’t give up, start researching how the encryption has been applied and if you can work around it. The adjusted files can be viewed here, but please keep in mind that you probably need to adjust them if the QEMU version is different or if you are lucky you can use the original ones from the panda git. That’s a much easier way indeed, thank you for this! Adjust 1024M to match the -m parameter. I put the memory backing file in /dev/shm so it’s in (swappable) ram, but you could also put it on disk. Then pass that backing file to volatility- live memory! That’s because the execution point is beyond that location. If I could pause the execution cmd.exe when it starts than your solution would be much better. Since we are past that point I need to jump back from 3.2 to 2. I’m glad you liked the article! Nice article..! But why you simply didn’t change “jz loc_7ff….” to “jnz loc_7ff….” (1 byte change). It causes that you don’t need to jump from step 3.2 to 2; but making the bad decision will run the cmd.exe … perfect job anyway, I really like this article.